We’re thrilled that our debut recording has reached the Top 10 in the UK classical album chart in its first week of release! We also made it to No. 3 in the UK Specialist Classical Chart. We are delighted to announce that Håkan Hardenberger has agreed to become an Advisory Patron for Septura. Håkan is the greatest trumpet soloist today – alongside his phenomenal performances of the classical repertory, he is also held in high regard as a pioneer of significant and virtuosic new trumpet works. 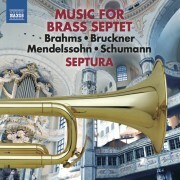 His approach to repertoire creation for the trumpet is something which Septura wishes to emulate for brass septet, and he will advise the group with these goals in mind. Håkan joins the advisory group alongside Dr. Martin Knight and Professor Jonathan Freeman-Attwood (Principal of the Royal Academy of Music). We spent the last few days recording our first CD for Naxos Records, which features transcriptions of choral and organ music for brass septet by Brahms, Bruckner, Mendelssohn and Schumann, alongside Bruckner’s Two Aequali for three trombones. The acoustic of St. Paul’s Church in New Southgate, North London proved ideal for this repertoire, and we are all looking forward to hearing the results. The disc is due to be released in summer 2014, so watch this space! We are pleased to announce that Septura will be an Ensemble in Residence at the Royal Academy of Music (London) for the 2013-2014 academic year. In addition to rehearsing and performing at the Academy, the group will be coaching brass students and giving them the opportunity to observe our recording sessions. We also have an exciting project in the pipeline with composition students, several of whom are penning new works for the group which will be played in workshops in January 2014. Click here to read the RAM Brass Department’s Autumn Newsletter.